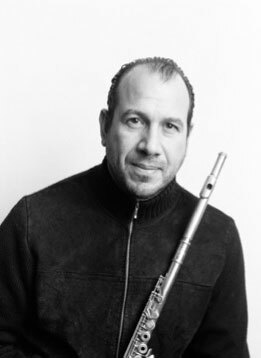 One of only a few flutists to have launched a successful career as an international soloist, Wissam Boustany is a performer who inspires audiences with his energetic and communicative music-making. His flute has taken him on numerous tours to Europe, the Middle-East, Far East, USA and Latin America, where he continues to present many concerts, master-classes and workshops. He embraces a wide repertoire, and has developed a keen interest in introducing the music of today within the context of imaginative program planning, which combines the innovative with the traditional. Amongst the composers who have written for him: Beat Furrer, Alun Hoddinott, Simon Holt, Tarek Younis, Carl Witt, Houtaf Khoury, Bushra el-Turk and Boghos Gelalian. He has also given the world premieres of Paul Reade's Concerto, Houtaf Khoury's Mirror of Eternity, Walid Howrani's Life Cycle, Peter Cowdrey's Land of the Prophets and Carl Witt's This Invisible World. As an orchestral musician, Wissam Boustany was closely associated with the Chamber Orchestra of Europe in the early 1980s, with whom he appeared as soloist on the award winning Deutsche Grammophone recording of 'Il Viaggio a Rheims'. Four solo CDs are currently also available: Wandering Winds, Sounds from Within, Vivaldi's Children and Mirror of Eternity. Wissam's experiences of the war in Lebanon have greatly influenced his outlook on both Life and Music. In 1995 he founded Towards Humanity, a multi-decade international initiative working with musicians and charities, helping communities who suffer from the tragedies of war. This project was inaugurated in February 1995 at the Royal Albert Hall, London. In 1997 he was awarded a knighthood by the Lebanese government (Chevalier de l'Ordre du Cedre) in recognition of his music and peace work. On 3rd February 1998 he was presented with the Crystal Award at the World Economic Forum in Davos, Switzerland. Wissam continues to use his music as a powerful healing force to open the doors of inspiration between people and nations, and help us reflect on our common humanity. Wissam currently teaches at the Royal Northern College of Music in Manchester.